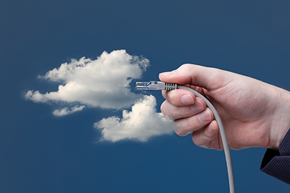 The training is most suitable for developer and consultants who are trying to use SaaS and PaaS together. Though the example use case uses some basic banking services, methodology used in the use case is applicable to any domain having similar requirements. 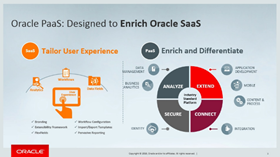 For additional information please see the integrate SaaS partner resource kit here. After having written this article explaining a variety of consensus mechanisms for Blockchain available today, I have received hundreds of comments and positive feedback from those were struggling to understand what makes cryptocurrencies and blockchain securely working in a decentralized way, after having reading my article and thus have clearly understood the foundation supporting Blockchain implementations (thanks for all my readers by the way). However, there are others that are still struggling to understand the benefits of a blockchain vs a traditional model based system, and where blockchain can be really a “breakthrough” when compared to what can be done and achieved by leveraging a centralized system model. Among dozens of mails I have received regarding the same sort of questions, that is, where Blockchain can be better than those traditional systems that we have been using for decades, I have decided to share one of my answers to one of these colleagues, since I have noticed that this could benefit others that eventually could be questioning themselves about the same topic. So, here is a sample question related to this concern mentioned above that I received from a colleague from the UK. I’ve read your comprehensive article and thanks for it being most useful and informative. I confess I may need to read it a second time to get a proper understanding of the intricate details and the “Proof of . . .” mechanisms and their pros and cons, but I think I understand the principle of Consensus Mechanisms. My fundamental question (and the reason for this reply to you) is “what are the real-world applications of a blockchain, and (playing devil’s advocate, if you’ll forgive me, why is it any more than an interesting computer science project?”. I can easily see its application to virtual currencies like Bitcoin (whose critics would decry it as no more than a baseless speculation mechanism), but I’m struggling to imagine real-world examples of why I’d need a blockchain, or why it’s better, in some way or other, than what already exists. Read the complete article here. It is likely that you’ve heard at least one description of what blockchain is, and that description probably had something to do with money due to many popular technologies such as Bitcoin, Ethereum, Ripple and many others currently available in the cryptocurrency marketplace. Blockchain has received a lot of attention for its “distributed ledger” technology, which is the basis for buying or selling cryptocurrencies and other assets through private markets. However, Blockchain technology has broader applications than cryptocurrencies. 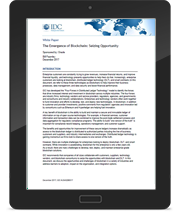 Today, blockchain is being already adopted as part of many everyday business-to-business transactions, including those powered by enterprise applications such as ERP, Supply Chain, Financial Services, etc. 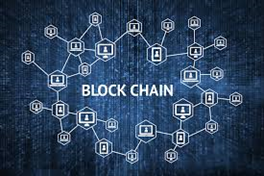 By definition, Blockchain is a continuously growing list of records, called blocks, which are linked and secured using cryptography. Each block typically contains a cryptographic hash of the previous block, a timestamp and transaction data. By design, a blockchain is inherently resistant to modification of the data. It is "an open, distributed ledger that can record transactions between two parties efficiently and in a verifiable and permanent way". 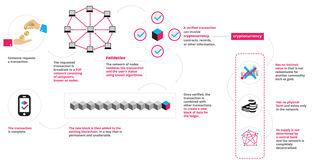 For use as a distributed ledger, a blockchain is typically managed by a peer-to-peer network collectively adhering to a protocol for validating new blocks. Once recorded, the data in any given block cannot be altered retroactively without the alteration of all subsequent blocks, which requires collusion of the network majority. Read the complete article here. 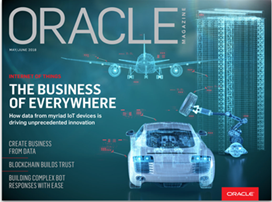 May/June 2018 issue of Oracle Magazine is focused on coverage of the Internet of Things. This issue’s cover story looks at IoT’s evolution from emerging technology to business opportunity. 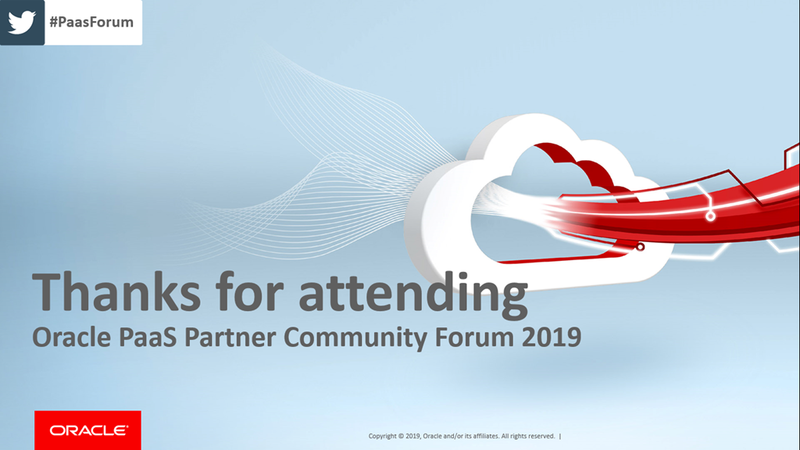 Customers of Oracle Internet of Things, Oracle Service Cloud, and Oracle Marketing Cloud describe their IoT experiences and the value it’s delivering to their companies.